An effective, safe and truly earth-friendly dishwasher powder that cleans dishes beautifully and leaves no toxic residues. 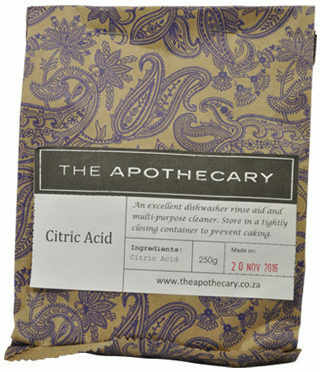 Use with Citric Acid Rinse Aid (below) or Spotless Citrus Infused Vinegar, or ordinary white vinegar, as a rinse aid. You can also use 1 tablespoon to wash dishes by hand in the sink. Dilute with warm water to use for general cleaning all round the home (1 cup to 4 litres of water, or more for heavy cleaning, or mix to a paste to form a powerful cleaning scrub for showers etc.). Sprinkle over stubborn grime on pots, pans, roasting trays etc. ; cover with warm water and leave to soak for 15 minutes to effectively loosen dirt. Wash as normal. An excellent dishwasher rinse aid and multi-purpose cleaner that is naturally occurring and biodegrades easily. Store in a tightly closing container to prevent caking. Fill your dishwasher’s rinse aid dispenser with a solution of 30ml citric acid:1 litre water, to keep things sparkling. Top up the dispenser as necessary (check it at least once a month). Run an empty cycle with a tablespoon or two of citric acid to clean up the inside of your dishwasher and get rid of deposits. Dilute with water (30ml: a litre) for a brilliant glass cleaner. Use to get rid of limescale buildup on taps or kettles. Use a stronger solution (125ml: a litre of water) to clean and disinfect counter tops or chopping boards. Citric acid kills bacteria, mold, and mildew. It is effective at removing soap scum, hard water stains, calcium deposits, lime, and rust. It is found naturally in food and water and biodegrades readily. 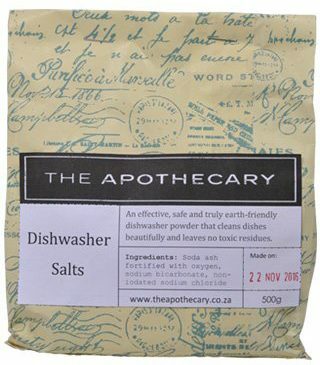 *NB: Before use, please ensure that your dishwasher’s Salt Compartment (normally located in the floor of the machine) is topped up with plain salt (sodium chloride). *NB! : When changing over from conventional dishwasher detergents and rinse aids, it is really important to first prepare your machine by clearing away deposits that are likely to have built up in the pipes, nooks and crannies of your machine. Otherwise, these deposits will be loosened by the cleaning action of the natural dishwasher salts and citric acid rinse aid, and redeposited on your dishes! To prepare your machine, put 1/4 – 1/2 cup of citric acid in the bottom of your empty dishwasher and start a normal wash cycle. After a few minutes (3-5), interrupt the cycle and allow the solution to soak in the machine for a couple of hours. Then resume the cycle and allow it to finish and drain the solution away. If your machine does not allow you to interrupt the cycle, instead run the longest cycle available with the citric acid in the bottom of the machine as above. *Fill the dishwasher detergent dispenser (1-2 tablespoons) and wash as normal. *Use a 30ml:1 litre solution of Citric Acid, or Citrus Infused Vinegar Cleaner, or ordinary white vinegar, as a rinse aid, to avoid cloudy streaks on glassware etc. *Clean your dishwasher’s filters regularly. This is very important, as otherwise the debris caught in the filters will be redeposited on your dishes. *Use 1 tablespoon to wash dishes by hand in the sink. *Sprinkle over stubborn grime on pots, pans, roasting trays, ovens, etc. ; cover with a sprinkling of warm water and leave to soak for 15 minutes to effectively loosen dirt. Wash as normal. *Use as above to get rid of tannin stains on teacups, mugs etc. *Dilute with warm water to use as a general purpose cleaner all around the home.